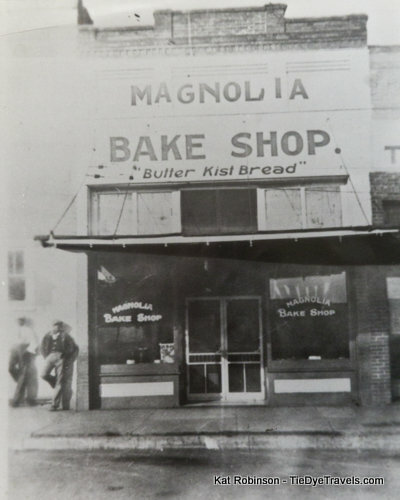 Magnolia Bake Shop in Magnolia is Arkansas's Oldest Bakery. The oldest bakery in Arkansas may very well be the Magnolia Bake Shop. Opened in 1928, it’s been in the family 88 years. 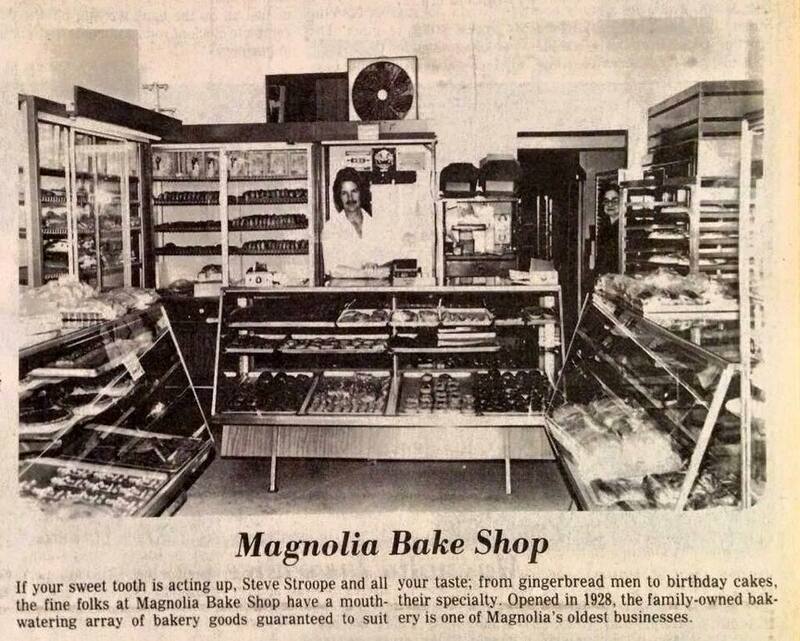 A couple of years ago, I had a chance to speak with Stephen Stroope, who owns the bakery with his wife Betsy. First thing I asked him was how long the bakery had been around. “Since water,” he chuckled, and dove right into the story behind the place. The bakery was started that year by Carmie Schobel Stroope, who’d been a dairy worker for several years. Stroope ran it for four years before selling it in 1932 to his wife’s two sisters, May and Hassie Beaty. They had the bakery for decades, never marrying, just turning out great baked goods. Stroope’s son Joe Franklin Stroope was an adventuresome young man who took to hitchhiking in his youth. He traveled to a lot of different places and discovered the world in this fashion. Back in 1941 he was hitching and a man pulled up in the finest car he ever did see and offered him a ride to Camden. Joe accepted that ride – and when he got in he saw a .45 caliber gun and a pint of whiskey on the front seat. 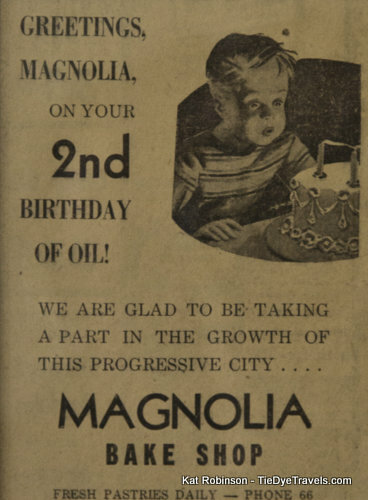 Turns out the man he accepted that ride from – was none other than Sid McMath, who would a few short years later become governor of Arkansas. 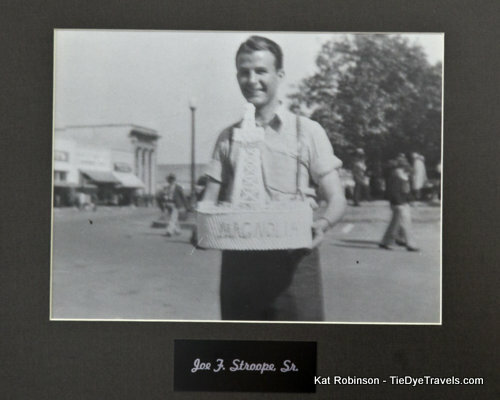 Sometime in the late ‘30s or early ‘40s, Joe traveled to Darien, Illinois and enrolled in the Wilton Cake Decorating School. Later on, he headed out to California, where he got to hear the big bands play. He took along his high school sweetheart, Martha, and there they started a family… and two bakeries to boot. 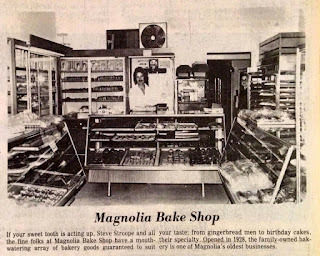 In 1961, he came back from California, bought the bakery from the two sisters and resettled his family there. His three sons also worked there, the youngest of them being Stephen, who was 10 at the time. The bakery by that point was well established, and it had a following. It would turn out cakes, particularly striped cake and whipped cream coconut cakes, fruit bars, iced butter cookies, German chocolate cake and more, day after day. He grew up during the Great Depression, and he was only broke once in in his life. And Stephen says Joe made a promise to himself never to be broke again. He kept the bakery open seven days a week, every day of the year, getting up in the early hours of morning and going in day after day. Joe’s brother, C.S. Stroope Junior, was also in the business. He ran Stroope’s Pastry Shoppe in Camden and passed it along to his son… it closed just a few years ago. The family also tried to put a shop in over in El Dorado – but it didn’t make it. 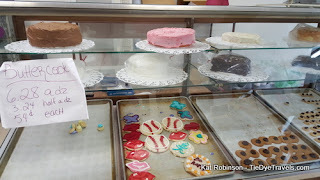 The way the Magnolia Bake Shop did things, was to keep things pretty much the same. “It’s hard to change something if it’s working,” Stephen states. Joe tried to introduce Danish cookies at one point. They just wouldn’t sell, until one of the local ladies bought up a bunch and served them at a party. Then they took off. Joe sold the bakery to his three sons in 1984. He passed away in 2007. Stephen’s two older brothers have retired, and for the last couple of years it’s just been him and his wife Betsy. At the time of this writing, she’s 64 and he’s 63. He takes to heart the old adage, “if it ain’t broke, don’t fix it.” Just about anything on the shelves is what you would have found decades ago. That’s a bonus for all of us, since it’s good stuff. And Stephen says it’s all thanks to his dad. did. I can see him when I do something, I can see him just plain as day. He’s the whole reason for it. Now I’m the last in the line. I don’t know… I don’t know what will happen to the shop. It’s been going 85 years. I’ll probably work another five years anyway, try to get others in there. I get up about 1:30 each morning, and I pretty much have to cut back. I can’t do it like I used to. Back Christmas Eve I could not get up to go back to work. I decided then I better slow down. I need to enjoy life… I don’t want it to be my whole life. And here’s where the story harkened back on the past… for me. I’m listening to Stephen’s story, and he shares this with me. “This lady called me one time, and asked if we wanted to come to Little Rock, this morning show… and my brother said ‘no thank you’ and that lady about had a stroke.” And when he shared that, I just smiled to myself. Because, dear readers… that lady was me. I wanted to share this story back in my TV days, back at Today’s THV… and yes, I was surprised at the time that someone wouldn't want the publicity. But now I understand. A couple of weeks ago, I was in town to talk with the Friends of Magale Library at Southern Arkansas University. I dropped in at the bake shop before I left town and took home an Italian cream cake that was just ridiculously perfect. The girl behind the counter told me some folks just wanted that frosting, it was so good. Magnolia Bake Shop is, as far as I've been able to tell, the oldest bakery in Arkansas still in continuous operation. While others such as Klappenbach in Fordyce and Myer's in Little Rock have passed with time, this little spot on the square is still making great baked goods and serving its community well. I hope it survives into a hearty future. 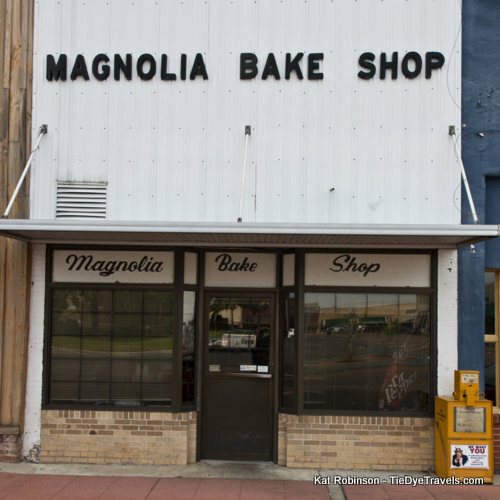 Magnolia Bake Shop is open Tuesday through Friday 6 a.m. to 5:30 p.m. and Saturday 6 a.m. to 4 p.m. Call (870) 234-1304 or check out the bakery's Facebook page for more information. Best cakes, pies, bread, cookies in the South. 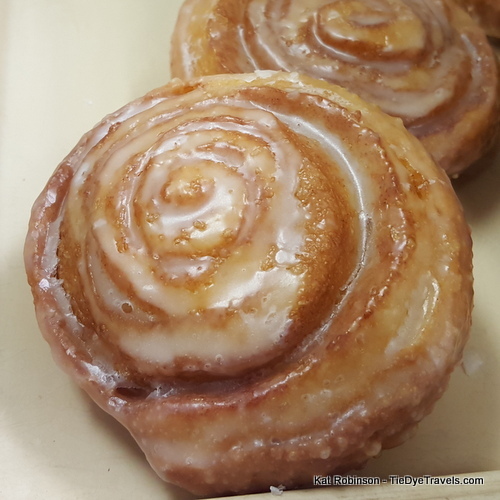 No need to bake at home when you can get it "home made" at the Magnolia Bake Shop. Congratulations Magnolia Bake Shop.